Trim and tie roasts if desired. 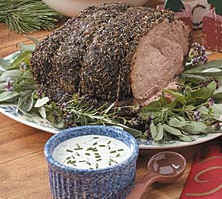 In a small bowl, combine the fennel seed, crushed rosemary, basil, marjoram, savory, thyme and sage; rub over roasts. Place with fat side up on a rack in a roasting pan. Top with onions and rosemary sprigs. Bake, uncovered, at 350 for 2-1/2 to 3-1/2 hours or until meat reaches desired doneness (for rare, a meat thermometer should read 140; medium, 160; well-done, 170). Discard onions and rosemary. Let roasts stand for 10-15 minutes before slicing. Meanwhile, in a small bowl, combine the sauce ingredients. Serve with beef.